'Section' umbrella Rain ♥ Kim Tae-hee "Wife in Wonderland vs Wonderland"
[TV report = Shinnara reporter] The marital relationship of Rain-Kim Tae-hee couple was revealed. On the 7th, MBC 'Sections TV Entertainment Communication' was set up with a Golden Corner Corner. On this day, the spectator explained the beauty of Mr. The spectator said that Kim Tae - hee 's face was "the face that was filled the most with a golden ratio mask". "The place of Rain is honor, Rain is the style of public worship," said Kim Tae - hee, the wife 's wife holding the initiative. Here’s the clip on KimBi Couple being a well-matched couple!!! Let’s talk about love! 2018 is starting off well with the revelation of the first three couples of the year: G-Dragon and Lee Joo Yeon, Jung So Min and Lee Joon, and G.O and Choi Yeseul. With two out of the three aforementioned pairings being confirmed, we can only hope for more happy couples to come. As the new year literally just started, let’s look back on 2017’s six hottest celebrity couples that melted our hearts. Last year has been full of love for Rain and Kim Tae Hee. The two lovebirds have blessed us with news of both their marriage and their first newborn a few months later. The power couple is a vivid example of patience and faithfulness, as they met not long before Rain’s already appointed military service, and Kim Tae Hee would always visit him at his army base to go on dates. It’s the start of a new year, which also means that we are going to be a year older and so are the songs we listen to. When does a song officially become a classic? We’re not sure either, but here are some hits from 2008 that we’re still bumping and will continue to do so as time goes by. This list wouldn’t be complete without Rain’s “Rainism.” This popular hit is often covered by juniors in the industry, paying their respects to the legendary solo artist, Rain, who is still hard at work! I’m sure we’ll be writing about his famous songs even 10, 20 years from now. When they met on the set of a TV commercial in 2011, it was love at first sight for Rain and Kim Tae Hee. The two lovebirds dated for a long time before getting married in a quiet ceremony in January of 2017. Top ten celebrities with biggest real estate in 2017.
Credit images used in the fan art : owners. FMV on KimBi couple’s First Wedding Anniversary!! An old FMV but with a change of song. No news of the couple for so loonnnggg....So, I picked the article below which is a rehash. Still good to note that the couple is very much remembered in the media circle. [OBS unique entertainment news Kim Sook Kyung] Rain, Kim Tae Hee couple was the most special wedding ceremony. OBS 'Unique Entertainment News' (Director Yoon Kyung-chul, writer Park Eun-kyung, Kim Hyun-sun) looked at the stars who sent the most special wedding ceremony that was only once in life. Rain, Kim Tae-hee couple surprised the world with surprise wedding announcement last year. But what was even more amazing was a simple wedding scene that was not like a top star couple. One of the places they chose as their wedding venue was a church in Gahoe-dong. This cathedral has been the site of the rain for a long time. Particularly, the acquaintances said that the wedding ceremony of the two people was simple and sacred. Two people said that they removed wedding ceremonies and flower decorations and married photographs were left to the guests, not professional photographers. The wedding dress, which Kim Tae-hee, a native of the Department of Clothing and Textiles, went through to seek out her own stylist and fabric, added the meaning of marriage. Hi Nancyzak, RAIN & KTH are spending their Lunar New Year in Tokyo, Japan. They were there last Thursday yet but no idea if the couple are still there up to now. Thank you so much, dear, for the update. Before this, I only saw Rain, captured by fan. Great to know that Rain was with KTH. It’s time for a romantic couple getaway, I should say, with Rain finishing The Unit(?) before he goes on to film his new drama, Sketch. Oh, I got the pictures of the couple from the IG sphere, which I’ll post after this. What I like to see is Rain placing his hand on KTH’s hip and KTH looks like giggling at him, hehehe...... Awww, okay, what’s so surprising, huh, after all, they are man and wife, one may ask right? I guess, not seeing the couple in public for so long just get one excited, to seeing them in public finally... and “PDA-ing...” as a bonus!!! Now, the second picture shows Rain alone and could the image of a lady (shoulder down) is that of KTH? Hmmm......We can’t tell unless there is disclosure after this. Also, it seems KTH has a huge bag (behind her). It looks big enough to stuff lots of shopping goodies for all the 3 in the KimBi family!! Here we go, the pictures of Rain, with the first, of him and KTH, in Tokyo. Hi Nancyzak, I guess that's her! Yessssss...the magical word......BLISS for KimBi Couple! Sports Seoul Shin Hye actor] Kim Tae-hee and Rain-married couple's trip to Japan is a hot topic. On the 22nd, China's "Sina Entertainment" said that Kim Tae-hee and Rain-married couple in Tokyo was captured by netizens. 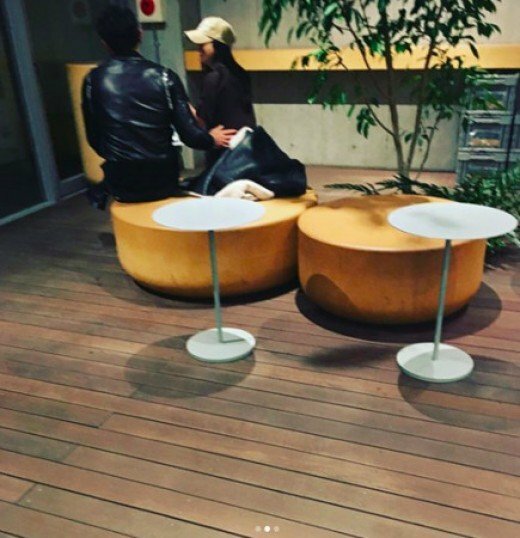 According to the report, a netizen posted an image on the SNS saying that he witnessed Kim Tae-hee and Rain-married couple at a famous coffee shop in Tokyo. In the photograph, Kim Tae-hee and Rain sat in a cafe chair and played a sweet play. I was also able to see Rain that was drinking coffee. In another photo, Rain is wearing a leather jacket and walking through the streets of Japan with sunglasses. Another netizen posted a luxury hotel where Kim Tae-hee and Rain-married couple stayed together. The hotel where the Kim Tae Her and Rain-married couple visited has attracted attention with its spacious and pleasant interior. It was a luxurious hotel with an outdoor pool. As a Korean-American couple, they are attracted to the attention of two people in Japan. In the past 15 days, shopping was seen in Harajuku. On the other hand, Rain and Kim Tae - hee married in January of last year and received their first daughter on October 25 of the same year. Rain and Kim Tae Hee have been captured during their trip to Japan. According to a Taiwanese media outlet ET Daily on February 22, the celebrity couple was recently spotted enjoying a lovely date at a cafe in Japan. The two stars are seen sitting next to each other. Rain is also captured sweetly wrapping his hand around Kim Tae Hee's waist. It's assumed the couple went on the trip to celebrate their 1-year wedding anniversary. Last year in January, Rain and Kim Tae Hee got married and welcomed their first baby girl in October. 2. [+765, -43] A woman's happiness comes from loving a man who only loves and cares for you. Never continue dating a man who wonders about other women while with you. 4. [+52, -6] Lee Hyori said that being rich and free helps you relax enough to be good to each other ㅋㅋ All of you could be going on vacation, being caring like Rain, and dolling up like Kim Tae Hee if you had the money. Don't blame your partners for not giving you this type of happiness. Blame yourselves and your own economic situation. 6. [+33, -8] Must be nice... I gave birth around the same time as Kim Tae Hee but my kid has a fever and my husband's blaming it on me... when he never even watches the kid, sigh... I may not be Kim Tae Hee but I make as much as my husband does... so jealous of Kim Tae Hee. 8. [+20, -3] Seeing her smile so brightly like that just shows how good Rain must be to her. It's nice to see them living so happily together. The actor Kim Tae Hee and the singer Rain couple are having a daily life of falling honey. On April 3, Sina Entertainment quoted a media report from Taiwan as saying that Rain and Kim Tae-hee recently enjoyed a late-night date at a coffee shop in Namsan, Seoul. The media said that Kim Tae-hee, who had taken the advertisement in the last three and a half months after giving birth in February, boasted her slim figure as before the birth, and the two returned home after a Tokyo date at the end of last month. 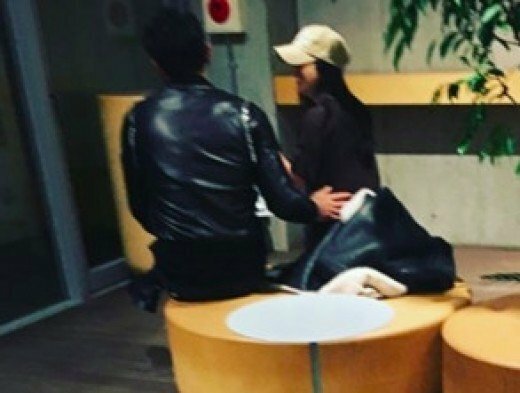 In the photo together with the photo, Kim Tae Hee and Rain, who are sitting side by side in a coffee shop in Namsan, were shown. Chinese netizens who have been exposed to the report say that they are "very happy". On the other hand, Rain and Kim Tae - hee married in January of last year received their first daughter on October 25 of the same year.